Our company, The Safety Tape Store, specializes in providing Non Skid Safety Tape, Floor Marking Tape and Reflective Tape to commercial and consumer markets. We also carry floor tape applicators and striping machines. Our products are commercial quality and simple to install. All of our non slip tape rolls consist of a mineral abrasive coating on a rugged film with an acrylic adhesive. Each roll has a release liner that you peel off before applying. Our non skid tapes are easy to install and can handle heavy foot traffic. We sell most of our non skid tapes BY THE CASE. This allows us to make them much more affordable. If you have any questions call the safety experts at steve@reflectivestore.com or click here for our contact information. Non skid tape is used in many environments and for many applications which is why we carry a variety of types and colors. Our most popular line of tapes is our Standard Black Gator Grip and more Affordable True Grip tape. For more rugged applications where extra grip is needed we carry Coarse and Super Coarse Black Gator Grip Non Skid Safety Tapes. For areas that need to be mopped we carry a Mop Friendly Non Skid in black, grey and white. 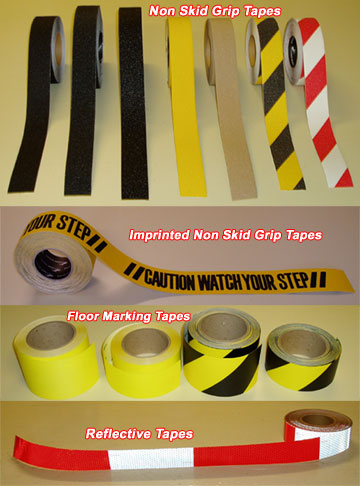 We also carry different Colored Non Skid Safety Tapes for marking off special areas. We have yellow, clear, red, white, brown, green, blue, ylw/blk, wht/blk, grey and stadium yellow. For bath, spa, and other bare foot areas we carry a very nice Resilient Soft Non Skid Tape in White, Black and Grey. Great for wet areas and bare feet. For dark stairwells or other areas that need visual guidance as well as non slip safety we carry Glow In The Dark Non Skid Tape (photo-luminescent). We also carry precut 6" x 24" non skid Cleats or Treads. We have a 46 grit black grade and a 60 grit yellow / black grade with either CAUTION or WATCH YOUR STEP imprinted on it. We now also carry the 6" x 24" cleats with a glow in the dark strip or a reflective yellow strip. Our Floor Tape Applicator is great for applying our Pavement Marking Tape and our Vinyl Floor Marking Tape. It lays down both tapes very efficiently. We also carry Paint Stripers for applying paint to parking lots and factory floors. For marking warehouse or factory floors we carry Armadillo and Tuff-Mark floor tapes. We carry both 2" and 3" x 54' rolls in the Tuff Mark and 3" x 108' rolls in Armadillo Tape. Tuff-Mark floor tapes are extremely tough and can hold up to floor buffers and fork lift traffic. Armadillo tape is the most durable floor tape on the market and is non skid as well as low level reflective. We also carry Prestriped Reflective Barricade Tapes as well as a full line of 1" and 2" DOT C2 Reflective tapes for trucks by "Oralite". For emergency vehicles we carry a 5 types of Reflective Chevron Striping tape all of which comply with NFPA 1901. We accept Master Card, VISA, American Express, Discover, Paypal Payments, Money Orders and Company Checks as payment. We invite you to browse through our store and shop with confidence. You may create an account with us if you like, or shop as a guest. Either way, your shopping cart will be active until you leave the store. To view our full line of reflective tapes visit our main site at www.tapedealer.com . Colored Non Skid Tapes in 2", 4", and 6" widths. 60 foot long rolls. Available in Yellow, Red, Blue, Green, Grey, Brown, Ylw/Blk, Wht/Red, Clear, White, and Stadium Grip Yellow. 3" Premium Non Skid Traction Tape in Yellow imprinted in Black with //CAUTION WATCH YOUR STEP//. Sold by the case of 4 rolls. 6" x 24"/30" Non Slip Traction Cleats available in Black, Coarse Black, Conformable, Clear, CAUTION, WATCH YOUR STEP, Hazard Striped, Glow Stripe, Reflective Yellow Stripe, Barefoot Friendly cleats and more colors. Packs of 50. Quantity 1 = 1 Sheet or Roll of Shapes On this page we sell a large assortment of Reflective Shapes designed for a variety of applications. Our reflective shape categories are as follows (use the drop down menu above to make your selection. 5-10 year rated Oralite (formerly Reflexite) DOT conspicuity tape available in 7/11 , 6/6 , or solid white patterns. We carry 1", 2", 3", 4" rolls in both 30' and 150' rolls. 4" . 6" , 8" Engineer Grade or High Intensity Prestriped Self Adhesive Reflective Hazard Tapes. 150 foot rolls. Available in White / Orange and White / Red. Our Reflective Gate Arm Tape is designed to stripe gate arms. Meets the new MUTCD standards. Used at railroad crossings, toll gates, private gates and more. 16" alternating red and white. (silver) 1",2",3" & 4" x 150' rolls. To enter pricing use the drop down menu and choose a factor and then enter a quantity. Example - for $900 choose $100 and then select a quantity of 9. Example - for $156.23 choose $100 - Qty 1 , $1 - Qty 56 , 1 cent - Qty 23 Enter the order description in the box called "Special Instructions".